Sowar = Trooper, 3rd Punjab Cavalry. Duffadar = Sergeant. 11th Bengal Lancers. A water carrier serving with the 27th Punjab Native Infantry. India General Service Medal (1854-95) Chin-Lushai 1889-90 Lieut. A.L. Phillips. S.C. Colonel Alfred Lucian Phillips was born on 24 March 1861 in Bombay, he was commissioned from the Royal Military College into the Dorsetshire Regiment in January 1881, and later admitted to the Indian Staff Corps on 1 July that year, advanced to Assistant Commissariat Officer in the Lushai Column and qualified for the 1903 and 1911 Delhi Durbar medals where he was serving as Colonel of Supply and Transport, 8th Division. He retired from service in 1913 but reengaged for service out the outbreak of WWI and went to France on 16 September 1914, after the war Phillips retired from service and resided in Milverton, Weston Park, Bath and died on 7 December 1940. Captain Hume Guilford Rochfort was born in 1888 in Hyderabad, Deccan India, educated a St. George's Grammar School, and a two year course in Civil and Mechanical Engineering at the Crystal Palace School of Engineering (1911-1913), in 1914 he was engaged as Assistant Engineer in charge of Nirmal Sub-division Adilabad District (Roads & Buildings) including the reconstruction of the Nagpur road in 1916. In 1917 he was commissioned Lieutenant in charge of the Military Works as Garrison Engineer, Tank, North West Frontier Province, constructing factories, railway lines, roads, wells etc and in 1918 and 1919 he was promoted to Captain and put in charge of Manjai Cantonment, erecting 40 barracks and 6 officers' quarters in addition to 12 miles of roads. Research includes a full list of the projects on which he worked during the war. 1914/15 Star LIEUT. C.B. MOSSE, 1/116/MAHRATTAS. British War Medal LIEUT. H.F.G. PITT. Victory Medal LT. C.B. MOSSE. Copy research. Claude Boileau Mosse was born 8 October 1893 in Mhow, India, the son of Charles George Drummond Mosse, Surgeon-Captain, Army Medical Staff. Commissioned from Royal Military College as 2nd Lieutenant, Indian Army Unattached List 24 August 1912. Posted to 116th Mahrattas 2 November 1913.His MIC shows that he qualified for the 1914/15 Star in the Tochi Valley 28 November 1914. 1939 census living in Weymouth, "on leave pending retirement, Lieut. Col. Indian Army. Air Raid Warden." Retired 23 February 1940. He died in Weymouth 23 November 1975. NOTE BRITISH WAR MEDAL IN ABOVE GROUP IS NAMED TO PITT: Copy research. Horace Frederick George Pitt was born 1885 in Northampton. The family moved to India soon after, as a brother, Hubert Cyril Pitt, was born in Bombay in 1887. He married Ellen Maude Backhurst in Secunderabad 23 January 1907. His occupation was "Fireman, H.H.N.G.S. Rlwys." (Hiss Highness Nizam's Guaranteed State Railway). A daughter, Phylis Blanche Pitt, was born in Dornakul, India in May 1908. In 1924 he visits England and is listed as a railway official. Awarded the Volunteer Force Long Service Medal (Indian Army Order 35 of 1927): Private H.F.G. Pitt, 1st Battalion Baroda and Central India Railway Regiment, A.F.I. India General Service Medal North West Frontier 1930-31 MAJOR W.R. WARDEN, 2-9 JAT R.
Copy research. William Reginald Warden was born in Secunderabad, India 27 December 1885, the son of Lieutenant Edmund Warden, Madras Staff Corps. Educated in England, he was commissioned into the Indian Army, Unattached List January 1905. Posted to the 83rd Wallajahbad Light Infantry June 1907. He married Marion Kathleen Kowsell at St. John's Church, Cannanore, India 5 September 1914. 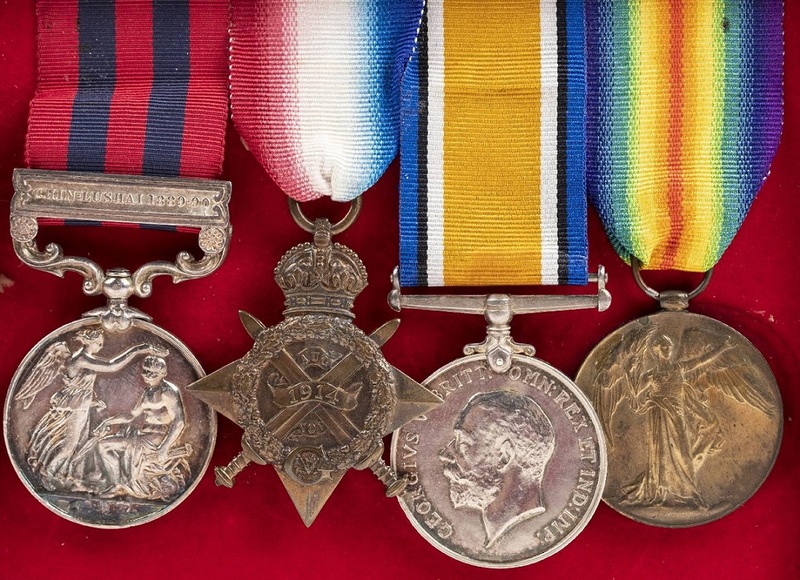 MIC shows he was issued 1914/15 Star, British War Medal, Victory Medal and General Service Medal with clasp Iraq serving with 2/3rd Madras Regiment and Indian Signal Service. (Acting Major while commanding a Divisional Signal Company). His Officer's Confidential Report states "29-12-15 to 17-2-16 Iraq, Tigris Corps Headquarters, Capt. Offg DD.S. & Tels. 17-2-16 to 23-4-16 Iraq, Tigris Corps Signals, Capt. i/c R.A. Sigs: Tigris Corps. 26-9-20 to 3-5-21 Iraq, 63rd P.L.I. Major." In January 1927 the Cheltenham Chronicle reported that the Divorce Court had granted a "decree of restitution of conjugal rights" to Mrs Marion Kathleen Warden, of Queen's Road, Cheltenham, on the grounds of desertion by her husband, Captain William Reginald Warden. Three years later their divorce was reported on the grounds of "misconduct of her husband, William Reginald Warden, with a woman at an address in East Molesley, Surrey. 20 February 1931 he was married in a church in Bombay to Alice Freda Wallace, of East Molesley, Surrey. He claimed to be "unmarried". Served with the 2nd Battalion 9th Jat Regiment during the Red Shirt Rebellion 1931 (medal and clasp) as 2nd-in-command of the battalion. In 1932 he commanded 10th Battalion, 4/9th Jats. Retired 1934 as Lieutenant-Colonel. London Gazette 26 September 1939: Royal Air Force Reserve, Reserve of Air Force Officers. Lt-Col. William Reginald Warden (I.A. Ret.) is granted a commission in class CC as Flight Lieutenant with effect from 21st July 1938 and is granted the rank of Squadron Leader with effect from 17th April 1939." (Class CC - Non-specialist civilians who would be commissioned on mobilisation - no training)." London Gazette 19 January 1940: Squadron Leader William Reginald Warden relinquished commission in class CC in appointment to commission in the RAFVR, 1st September 1939. Wing Commander 1 September 1942. After the war he lived at Haydon Farm, Cullompton, Devon and died 25 December 1963 at Trinity Hospital, Taunton. The three medals appear mounted as worn, possibly his earlier medals were separated in the divorce? Copy research. George Frederick Camm was born in London, 1895. Educated at Emanuel School, served as Cadet Colour-Sergeant, Emanuel School Contingent, O.T.C. Commissioned 21st London Regiment (1st Surrey Rifles) 17 October 1913. Served in France from April 1915 (received 1914/15 Star, British War and Victory Medals). Commanded a Trench Mortar Battery 1916. Listed as wounded in The Army and Navy Gazette 28 October 1916. Temporary commission Indian Army Reserve of Officers 5 December 1919. MIC shows Supply and Transport Corps. Relinquished commission 12 August 1922. 2nd Lieutenant, Regular Army Emergency Commission 11 September 1939 (The Queen's Royal Regiment). In May 1942 he is listed on a ship, with his brother Edward William Camm, leaving Liverpool on the "Prins Willem III" heading for Georgetown, British Guiana. Both are shown as "Army Officer". War Substantive captain 4 March 1944. He died in Hove, Sussex in March 1956. Medal mounted for wear. London Gazette 7 February 1919 states that Colonel Indra Shumshere Jung Bahadur Rana was awarded the C.I.E. He was born at Seto Durbar, Katmadu and educated at Narayanhiti and Durbar High School, Katmandu. Appointed Colonel in Nepalese Army 1908 and served with the Nepalese Contingent in Afghanistan 1919. Also received the Order of the Star of Nepal 3rd class. He died 3 June 1926. Troop-Sergeant in the Indian Army Service Corps (Animal Transport). Bombay Group, Royal Indian Engineers.